Jay Frost’s piano accompaniment takes center stage in Come to This Fountain, an instrumental arrangement of his and Tessa Frost’s solo setting of Mary Baker Eddy’s well-known “Communion Hymn”. The combination of flowing arpeggios accented with richly resonant bass chords provides an uplifting tone that befits Mrs. Eddy’s words. This song is from Piano on 24th, an album of solo piano pieces comprised of joyful, pure, inspirational compositions which segue into colorful tunes with flares of minor themes, flamenco, and rock piano. These compositions of Jay’s were written over a broad period of time – some just before the recording, others over 10 years ago. 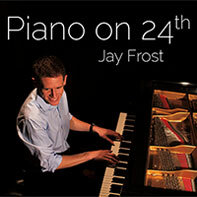 Jay Holcomb Frost is an inspirational music composer and jazz pianist. The piano/voice compositions that he writes with his wife are published here on Watchfire Music and have been performed in church services across the country. Jay’s jazz piano chops take him to corporate events, private parties, weddings, and restaurants across the DC area, and he can occasionally be found in community theater. He frequently performs and composes with his wife, Tessa Frost.